The I-Tech 4x3500HD amplifier is the industry’s first high-powered tour sound amplifier featuring four inputs, Analog, AES3, and CobraNet™, fully routable to any one of 4 outputs. Each channel features a complete compliment of OMNIDRIVEHD™ Processing, including the acclaimed LevelMAX™ Limiter Suite, and support for linear phase FIR filters as used in the latest JBL V5 loudspeaker tunings. 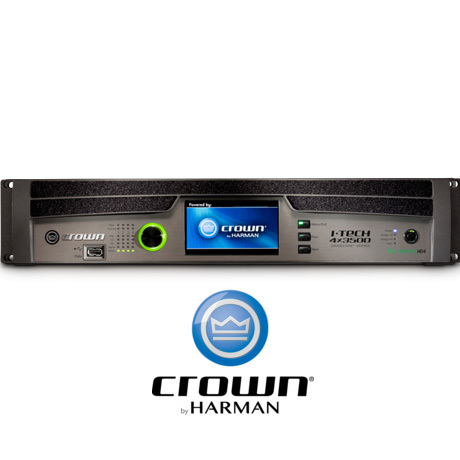 Combine that with Crown’s patented Class-I technology delivering uncompromising power output across all four channels, and it’s easy to see why the I-Tech 4x3500HD is the flagship tour sound amplifier from Crown.